When you move into a new city, there are certain things people tell you; remember to tip pretty much everyone, the public transport isn't good enough (don't worry, I come from a city where it's worse), there are four seasons in one day so dress accordingly (or don't worry about it because you come from Melbourne) and don't go near the Tenderloin. Out of those four points, I've taken about 1.5 of them on board. The 0.5 is regarding the Tenderloin - I've ventured there during the day and come out unscathed and with a fully belly to show for my courage. But really, it's not too bad - the signs of poverty are unsettling, but the people mostly keep to themselves. Returning to my food blogger roots though, there's some very good and cheap Vietnamese food there. 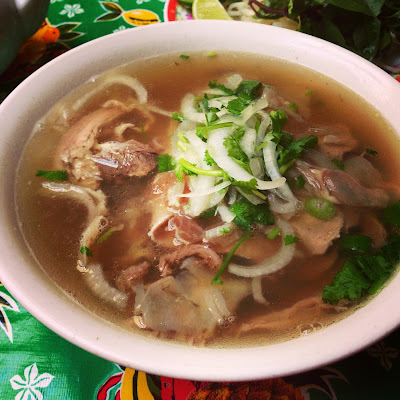 While Turtle is arguably the place to go for chicken pho, Pho 2000 does more than a decent job of dishing out enormous bowls of comforting rice noodles, slick in meaty broth and containing all manner of interesting ingredients. When I say enormous, I mean the bowls are ridiculously big. This is a regular sized portion. My belly hasn't shrunk to the point where it can't handle the amount of food, and indeed, was able to help a friend out when he wasn't up to the task, but there's not much need to order the large serving, especially if you're ordering appetisers. I have had better pho, but the offerings here were better than average and definitely had a generous amount of meat. I like having as many different ingredients in my pho as I can, so the option of having brisket, tripe, tendon and flank seemed pretty great to me. I made a point to return to Pho 2000 a few weeks after my first visit because the pho craving had hit, and nothing but a large bowl served up very quickly would do. Pho 2000 passed that criteria with flying colours. Standard service would be a slight let-down in most cases, but we aren't in the most refined part of the city and that's ok with me.